I’ve just returned from teaching algorithmic composition for a week at the Conservatorio Statale di Musica “Niccolò Paganini” in Genova, Italy. It was a pleasure to meet and work with Professor Roberto Doati’s composition class, as well as to play with some of them in a concert on September 7th that begain with a free improvisation for a group of six players. Included in that group were old friends Gianpaolo Antongirolami (saxophone) and Giacomo Lepri (melodica and electronics). Aside from the teaching and performing lots of pesto was consumed, of course. The main piece in the concert was my 40-minute algorithmic composition for piano and computer for rei as a doe. We performed this for the first time with a beautiful bespoke video made by Colin Lawson (paintings) and Chanté Inglis (animation). I’ll post a questionnaire about that collaboration soon, along with the new version of the video. 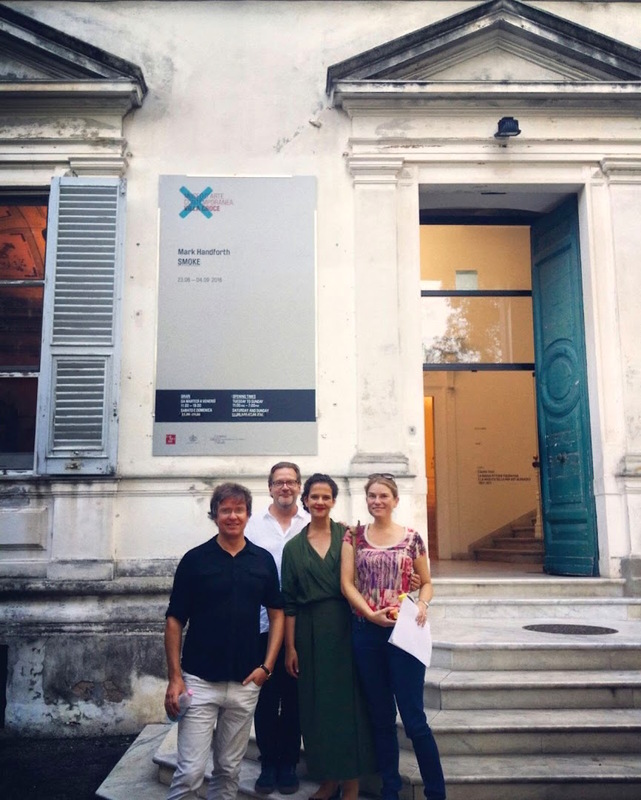 The night before the concert we did a presentation of the video in a more fine arts context at the beautiful Museo d’Arte Contemporanea di Villa Croce. Fascinatingly and animatedly compered by Prof. Doati we enjoyed an attentive and inquisitive audience that tolerated our verbose indulgences for two hours. At least one of them even came back for more, at the concert the next evening. We also enjoyed a nice writeup in la Repubblica, the Italian national daily newspaper. Because Chante made the video to synchronise with the recorded version of for rei, I had a challenge when it came to making the performance software for the live version. The existing MaxMSP software uses trigger points in the score to start sound files which run alongside the piano textures. Due to the constant slow tempo and the many pauses, a full-length performance of for rei can last between 37 and 44 minutes (perhaps even more). Synchronising the fixed-timeline video was a case of tracking the timing of the trigger points during the performance, comparing these to the timings of the respective trigger points in the recording, and pausing the video if the live performance is taking longer or speeding it up if its quicker. I preferred this to chopping the video as, despite being up to 15% faster at some points and pausing at several others, playing back one long video file seemed smoother and less error prone than joining up several video files at the trigger points. Most important of course is that the artists were happy with this solution: as the video moves very slowly anyway, the slight changes in speed or pauses don’t interfere too much at all. Job done.